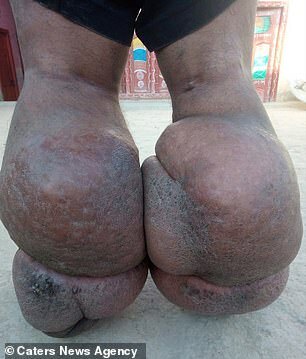 A man's legs have swelled to twice their size after he became infected with a parasitic worm five years ago. 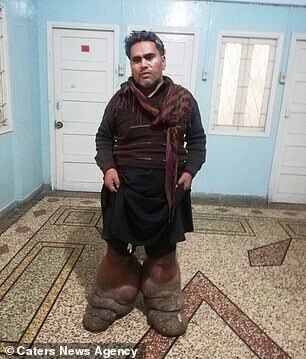 Shahid Hussain, 38 - from the Naushahro Feroze district in the Sindh province of Pakistan - suffers from elephantiasis. 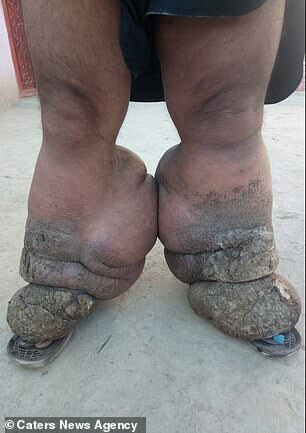 The father-of-five's legs weigh an astonishing 110lbs (7st 12lbs) and have a circumference of 88.9cm (35inches), leaving him virtually bed-ridden and scared he will end up 'paralysed'. The former garage worker has 'exhausted his savings' after his condition left him unable to support his family. 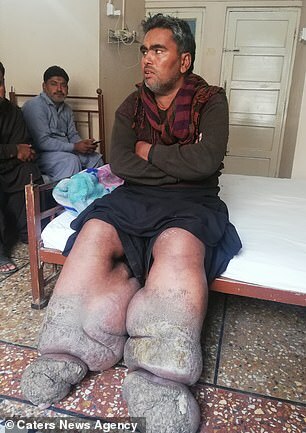 Speaking of how his suffering started, Mr Hussain said: 'I was living my life quite normally but five years ago my legs started swelling. 'Initially, I thought everything will be fine but now the disease has left me virtually bedridden and I can hardly walk. Since being forced to give up work, Mr Hussain became dependent on his relatives to keep his home running. His wife, Fatima Hussain, said: 'We were having a good life but things have changed completely. 'All our savings have [been] exhausted. The money we had saved for the marriage of our daughters is gone. Mr Hussain has seen several doctors in the city of Karachi, however, the medics said his condition was too severe for them to treat. 'A friend gave me some money so I [could] come to Karachi for treatment but [it was] all in vain,' Mr Hussain said. He has been advised to go to the Pakistan Institute of Medical Sciences in the capital city of Islamabad, however, Mr Hussain's family cannot afford to send him there. 'We didn't even have money to travel to Karachi, so how can we go to Islamabad, which is a costly city [where] we don't know anyone who can help us?,' his wife said.